My daughter made this at school and brought it home. I was stymied as to what exactly it was supposed to be be. Because we can all tell what this looks like! 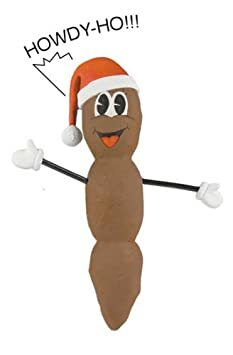 And I didn’t think they were supposed to be making a poop wearing a Christmas hat in the public schools. She said it was a cashew nut. But I think someone should have thought this art project through a little more. Today the kids were off school so that they could hold parent-teacher conferences. At the elementary school, this was easy: I just went to my kids’ classrooms at the scheduled time and spoke to their teachers. Little Boy and Little Girl were happy to show me everything at their school. At the middle school with Boo, it was a little different. They have so many kids that they held the conferences “arena-style,” which is not a term I was familiar with. “Arena-style” turned out to mean that all the teachers were in the gym together and the parents were supposed to go to each table and speak to teachers individually if they wanted. When Boo and I came into the building, I was met with some nice ladies at a table who asked me which grade my child was in, and then they directed me accordingly. Although I felt slightly clueless navigating this system, I soon figured it out. Still, at least I didn’t do as badly as the dad who came in after me. Posted on October 14, 2015 October 14, 2015 Categories RandomLeave a comment on Can you help me? After renting for the past ten years, my husband and I are enjoying the benefits of owning our own home. In other words, STUFF KEEPS BREAKING. Here is the latest: A mysterious fridge leak that has gone undetected for who-knows-how-long. Ugh. I’m in the process of fixing the water-damaged wall; my husband is fixing the fridge. Why did we stop renting again? People who hit “like” on garage sale page posts. I belong to some groups on facebook that are devoted to buying and selling used things and I’ve seen this many times. What is wrong with you? Either buy it it go away!